It seems like this Monday is DRAAAAGING so I thought it'd be fun to shake things up with a belated Star Wars giveaway. I mean, The Force Awakens just came out on DVD, and I hear there's a Star Wars influenced money grubbing film coming out in December so why not? I have to admit this is a long overdue giveaway: I hinted at it months ago here on Instagram and it even includes a 2016 calendar which I had all intentions of giving away for the New Year. I think I know what happened: the excitement of Star Wars was soon overtaken by the Steve Harvey debacle, and I admit I got distracted. Welp! We don't quite know how he learned it as he hasn't watched any of the Star Wars films, but we think Nia taught him. He ambles about randomly humming it, which makes for great conversation (and questioning of our parenting skills!) when we're out and about. People ask us, "How does he know that?!" We just shrug! 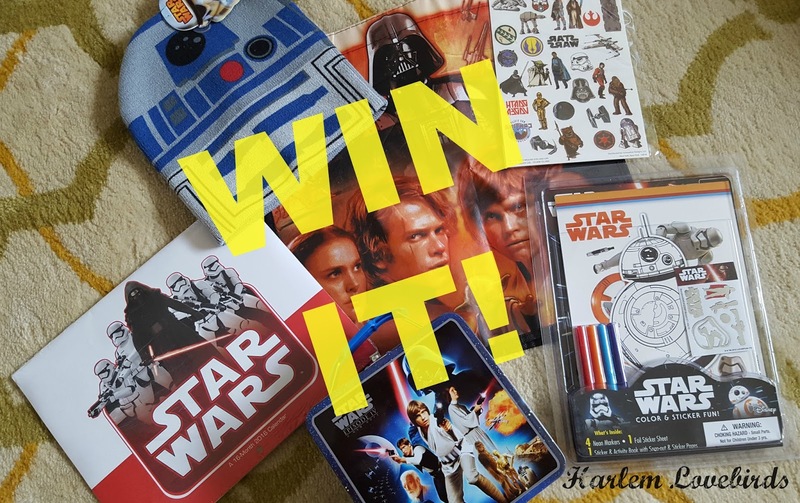 I put this giveaway together on my own when I got a bit carried away in the Target dollar bins months as I arrived right when they were getting stocked with Star Wars merchandise. I was the ONLY nerd one in the aisle! Oh and about the winter hat and calendar? I'd say just hang onto it for next winter and use Q1 for a collage. BOOM! Good luck and Happy Monday!